Industrial facilities like manufacturing plants, food processing facilities, and warehouses require flooring that’s up to a challenge. While there are many industrial flooring systems available today, few offer the combination of benefits you can achieve with industrial epoxy flooring in Nampa: affordability, longevity, and extreme durability.We install specially formulated industrial epoxy systems that can perform well in even the most demanding environments while maintaining a bright, clean, and slip-resistant surface. Our epoxy systems are able to withstand almost any type of abuse including chemical spills, battery acid, high heat, heavy loads, and vehicle traffic. We can even use specially formulated epoxy products based on your needs such as static dissipation flooring or battery room flooring. No matter what type of facility you manage, we can help you find the right epoxy system to meet your needs and budget. Epoxy flooring is a liquid-applied flooring system that is a combination of hardeners and epoxy resin. When combined, the two have a chemical reaction that forms a rigid and durable plastic material that's bonded to your concrete substrate. We install industrial grade epoxy floor coatings in Nampa, ID that are customized to the needs of your facility. Industrial epoxy is formulated to withstand all types of hazards like chemicals, abrasion, high heat, and vehicle traffic. 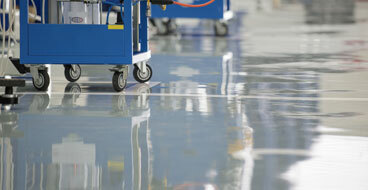 Industrial epoxy flooring in Nampa, Idaho is strong enough for even the most demanding industrial applications. We install seamless epoxy systems in all types of environments and industries ranging from machine shops and processing facilities to aircraft hangars and prisons. The following are some of the most common applications for industrial epoxy. Retail floors face frequent spills, constant foot traffic, shopping cart wheels, and heavy loads. An industrial epoxy floor coating is up to the task by delivering a slip-resistant, hard-wearing floor system that’s decorative and easy to maintain. We make it easy to customize your retail floor with endless colors, markings, and designs for branding. 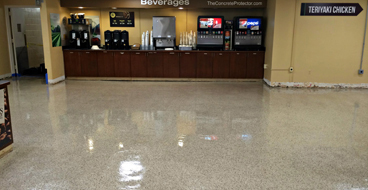 An industrial grade epoxy floor coating in Nampa is the ideal solution for all types of medical facilities including hospitals, doctor’s offices, veterinary clinics, and operating theaters. Industrial epoxy creates a seamless and nonporous surface that is easy to sanitize and gives pathogens nowhere to hide. It’s also resistant to heavy traffic and abuse and won’t be damaged by harsh cleaning protocols. From restaurants to food processing plants, a hygienic, seamless, and easy to clean floor is crucial. 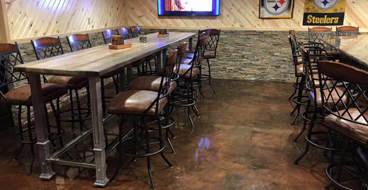 Industrial epoxy floor coatings are USDA approved to create a hard-wearing surface that tolerates even the intense demands of a food processing facility or commercial kitchen. Our epoxy systems withstand heavy traffic, harsh cleaning chemicals, oils, fats, and much more without deteriorating or harboring pathogens. One of the most crucial elements in a factory is a safe yet hard-working floor system. Factory floors must withstand heavy-duty abuse, extreme temperatures, chemical spills, and more. It must also be easy to clean and slip-resistant to protect workers from injury. Industrial epoxy meets all of these needs by brightening the work environment with a high-gloss, skid-resistant, and ultra resilient floor system that’s hard to damage. 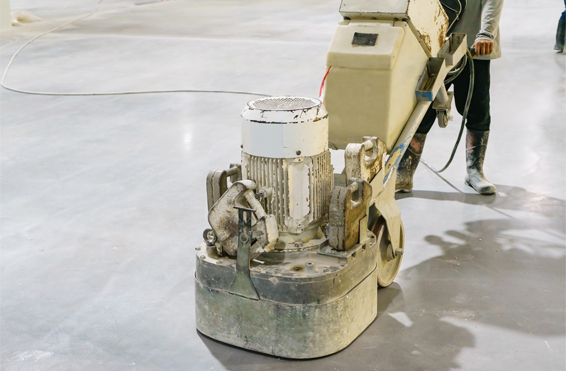 Untreated concrete isn’t a good solution for a warehouse as heavy loads, traffic, and spills will cause irreversible damage to the concrete, dangerous cracks, and eventually force expensive shutdowns and repairs. An industrial epoxy floor coating is the perfect solution for a warehouse environment because it bonds with the concrete and increases its tensile strength with the durability to resist vehicle traffic, heavy loads, chemicals, and more. We combine thorough floor prep with only the best industrial epoxy products to deliver results that outperform the competition and last for years. Don’t throw away your money on inexperienced epoxy contractors. Our industrial epoxy flooring installers have decades of combined experience installing epoxy products with the attention to detail necessary for superior results. We begin by carefully prepping your concrete floor with patching and repairs to address any damage like cracking and spalling. Next, we use diamond grinding to remove surface imperfections and open the concrete’s pores. This ensures a strong bond with the concrete and flawless final results. We use a special epoxy primer that acts as a moisture barrier before applying a multi-layer industrial epoxy system and topcoat formulated for the unique hazards in your facility.